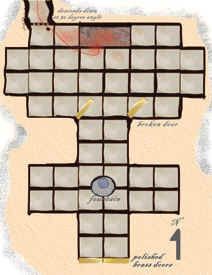 Usable battle map detailing an antechamber with a fountain and an evil altar room. A small scale image of the map is presented below. Larger chamber with altar on northern wall, blood trail leads out barred escape tunnel. Bronze doors open (the one on the right is broken). Great show-down room close-combat encounter. What creature has escaped the room leaving a blood trail behind? Perhaps a captive the PCs were looking for was taken away by an evil cleric. The PCs must battle the cleric's underlings and then safely pass the lowered gate to pursue their mission. Southern anteroom has fountain in center. Side rooms perfect for placing a few guards. What secrets does the fountain hold?